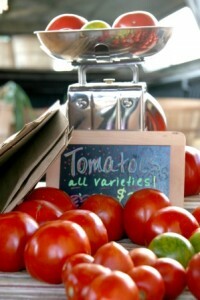 Tomatoes are here! 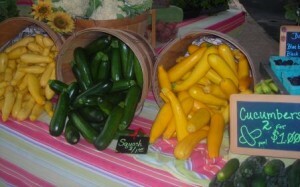 We will have plenty on Wednesday, along with an abundance of cucumbers and squashes. In fact we are over run with squash; zucchini ~ both green and golden as well as yellow summer squash ~ and we will be running a special on them Wednesday! We will have plenty of other veggies on Wednesday as well, new potatoes, green beans, Swiss chard, cabbage, cucumbers, and our new crop of “candy” onions. We may still have a few fresh peas available. We will start to pick the first peaches of the season this week and will have some available on Wednesday, of course these are not the free stone variety, but they are delicious.